In May 2012, Maurice Kachuk and his mother, Winifred Tkaczuk nee Bunker, contacted Eversholt2 to tell us some history. 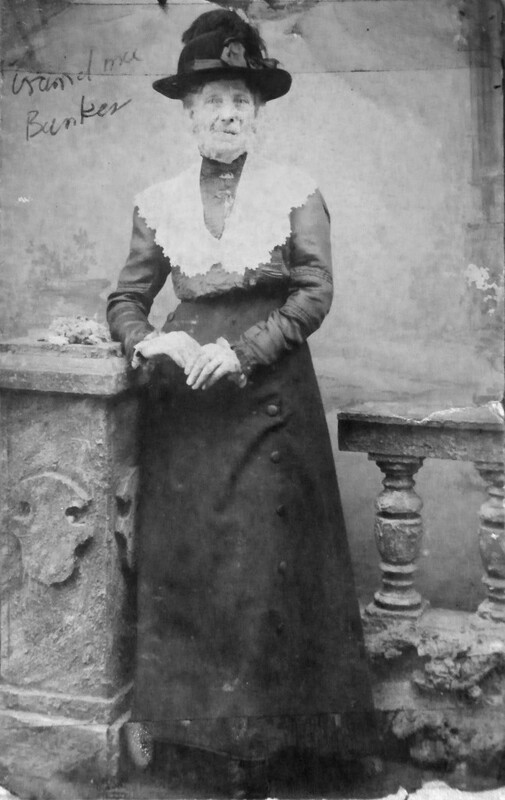 Winifred’s grandmother was Mary Ann Bunker. Maurice and Winifred visited Eversholt and brought treasures to share – thank you very much, both of you. Copyright of any items on this page remains with the original copyright holders, please. Contact us here if you’d like to make copies. Here is Mary Ann Bunker. Click for a bigger version. The prime exhibit was Mary Ann’s copy of her contract of employment, such as it was, with the Bedford Estate in 1911. 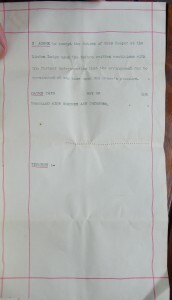 Here are pictures of the original paperwork. The photographs are not great, but the original is very stiff and firmly folded, and we didn’t want to damage it by flattening it out too much. Again, click for bigger versions. Instructions for Mary Ann Bunker, gatekeeper. 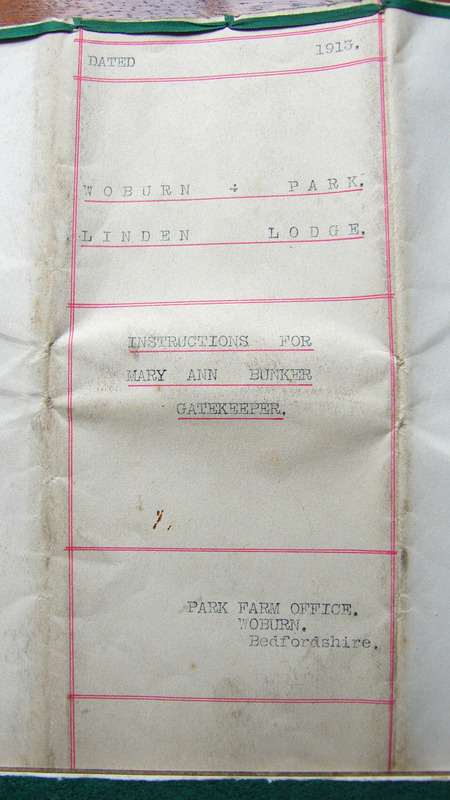 [sic] ANN BUNKER entered upon the duties of Gate Keeper at the above Lodge at a wage of TEN SHILLINGS (10/-) a week with Cottage and Garden Rent Free as from the 24th of June 1911. TO keep the Gates locked at all times and not to allow any unauthorised person to pass though them and to report the occurrence of any defects in the Gates or Locks immediately. 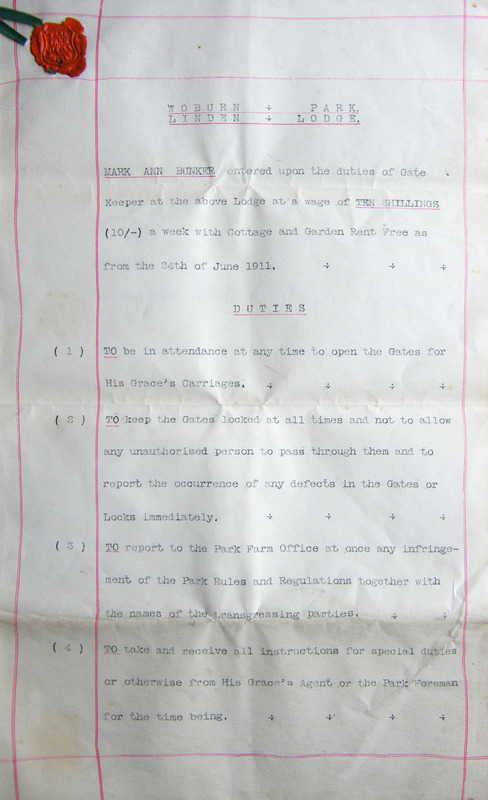 TO report to the Park Farm Office at once any infringement of the Park Rules and Regulations together with the names of the transgressing parties. TO take and receive all instructions for special duties or otherwise from His Grace’s Agent or the Park Foreman for the time being. I AGREE to acceept the duties of Gate Keeper at the Linden Lodge upon the before written conditions with the further understanding that the arrangement may be terminated at any time upon His Grace’s pleasure. Dated this ………… day of ……… one thousand nine hundred and thirteen. 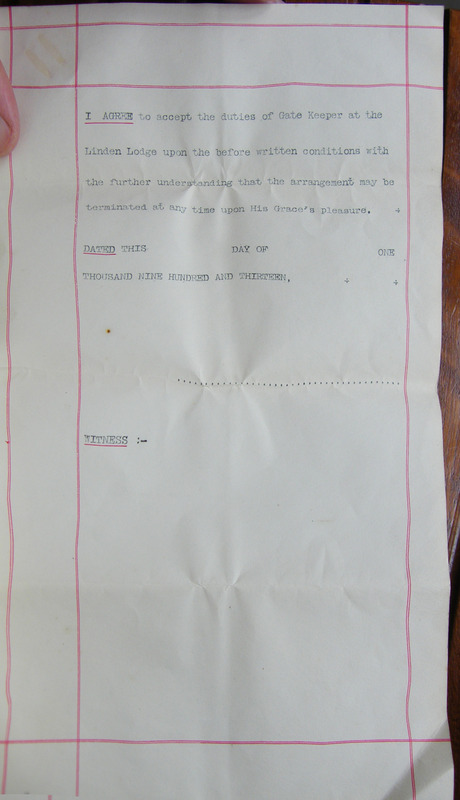 So the contract seems to have been regularising a situation in 1913 that had gone on informally since 24 June 1911. The duties were likely not onerous. The track past Linden Lodge at that time led only to a small farm, and the traffic would have been very predictable. The Lodge where Mary Ann lived, and likely the very gate that she guarded, can be seen here, and it’s still there today in Tyrells End. Joseph and Mary Ann are listed as living in “New End”, Eversholt, in the 1891 census. New End was what Linden and the cottages around it were called in the 1881 census, but by the 1891 census, there was only one house left, Linden Lodge, so that must have been where the Bunkers were living. 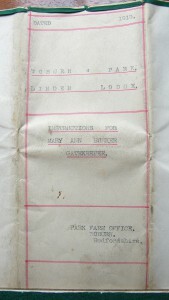 Joseph was listed as a “gardener’s labourer”, born in Steppingley about 1848. They were still living there in the 1901 census, when one of their children was Frederick C Bunker, who was Winifred’s father, born about 1898. The only credible-looking record of a Joseph Bunker dying is in 1918 in Biggleswade, so what he was doing on census day in 1911, and why Mary Ann was the gatekeeper instead of Joseph, remains a bit of a mystery.